Marklin 00770 Set with 12 Pairs of Cars from Marklin. 12 pairs of passenger cars consisting of German Federal Railroad (DB) "Umbauwagen / Rebuild Cars". Pair of Umbauwagen cars, type AB3yg-54, 1st/2nd class, and type B3yg-54, 2nd class; pair of Umbauwagen cars, type B3yg-54, 2nd class; and pair of Umbauwagen cars, type B3yg-54, 2nd class, and type BD3yg-54, 2nd class with a baggage area. Era III, version from the mid-Sixties. 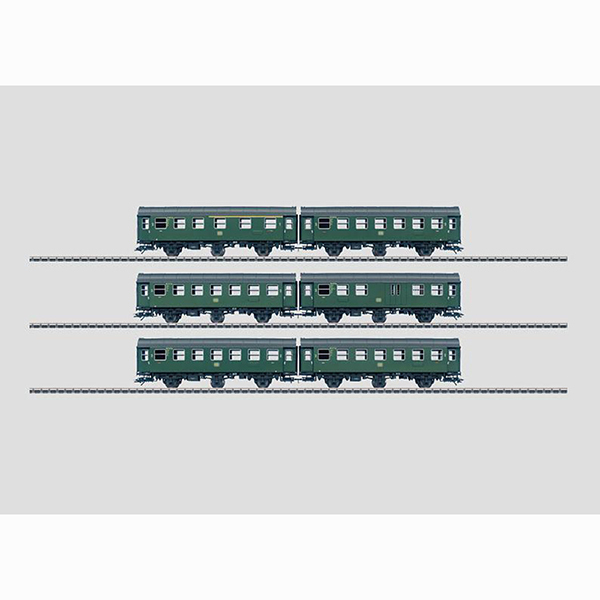 This is the 00770 Set with 12 Pairs of Cars from Marklin. 12 pairs of passenger cars consisting of German Federal Railroad (DB) "Umbauwagen / Rebuild Cars". Pair of Umbauwagen cars, type AB3yg-54, 1st/2nd class, and type B3yg-54, 2nd class; pair of Umbauwagen cars, type B3yg-54, 2nd class; and pair of Umbauwagen cars, type B3yg-54, 2nd class, and type BD3yg-54, 2nd class with a baggage area. Era III, version from the mid-Sixties. Model: The 12 pairs of cars come in an attractive display, 4 of each pair with different car numbers. The cars in each pair are permanently coupled together. Each pair of cars comes individually packaged in a marked box. Length over the buffers for each pair of cars 30.5 cm / 12. 12 pairs of cars from which to choose. All of the models with professional quality construction. DC wheel set for each pair of cars 4 x 700580 und 2 x 406240. These pairs of cars go very well with the class 64, item nos. 39640 or 39645.